The following comes from "The Lombardi Rules" written by his son, Vince Lombardi, Jr. This comes from the chapter "Work Harder Than Everybody." Don't buy the myth of the overnight success. Most of the people we celebrate for their effortless achievements have actually put a whole lot of energy into preparing for their victory. Lombardi noted that as an assistant at West Point under Red Blaik that is wasn't unusual for Blaik to reassemble his coaching staff after dinner to watch films and discuss strategies until midnight. Then they'd be at it again first thing in the morning. Lombardi carried these habits forward with him into his professional career. 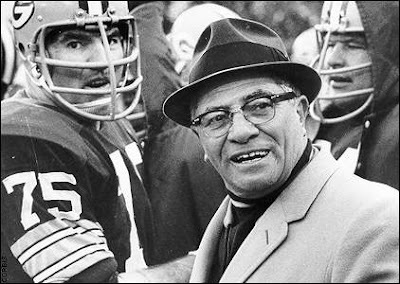 "When the other coaches -- the rest of us -- would leave the Giant offices," head coach Jim Lee Howell of the New York Giants once recalled, "there was always one light still burning, the one in Vince Lombardi's office." Lombardi place great emphasis on practice. He and his assistants would run the same play over and over and over again with Lombardi barking out "Run it again!" each time with there was even the tiniest mistake. After a while, it was the players who would yell "Run it again!" With hard work, practice and discipline, they were gaining complete confidence in their ability to execute this particular play. Perfect your discipline: Hard work is discipline: focused training that develops self-control. It helps you make the hard decisions, endure pain, and stay on track despite stress, pressure and fear. Invest in your talent: All too often, our culture celebrates success without effort. And all too often, these stories turn out to be untrue -- there has been effort -- or they celebrate a flash in the pan. You have a duty to invest in your talent, for the long-term. 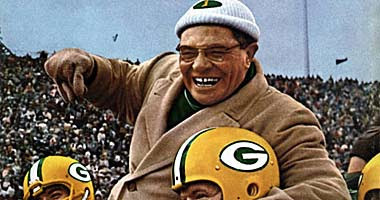 Start at home: Lombardi's grueling schedule sent a message to his players. They all saw him put in more effort than they did, and therefore were motivated to put in more effort themselves. "When people talk about leadership, they often use the word passion. And when we think about passion we tend to think of emotions like enthusiasm, zeal, energy, exuberance, and intensity. Well, all these attributions might be true, but when you look up the word passion in any dictionary that includes origins you'll see that it comes from the Latin word for suffering. Passion is suffering! A passionate person is someone who suffers and a compassionate person is someone who suffers with, and shares the suffering of, others -- and wants to take action to alleviate this condition. Nearly every act of leadership requires suffering -- and often for the leader a choice between one's personal success and safety and the greater welfare of others. We're asking you to understand that nothing great comes without costs. Leadership is hard work. It's not easy despite what we, or others, may write in our attempts to make leadership more accessible. We'll all be remembered for something. The question is, for what? What will others say about you when you're no longer around." There are so many websites out in cyberspace that can be beneficial to us as coaches, players and fans that I thought that from time to time I would introduce you to some in case you weren't aware of them. "Success is peace of mind which is a direct result of self-satisfaction in knowing you made the effort to the best at which you are comfortable." The site has a lot of great stuff including some video of Coach Wooden and a lot of books and materials from and on Coach Wooden. 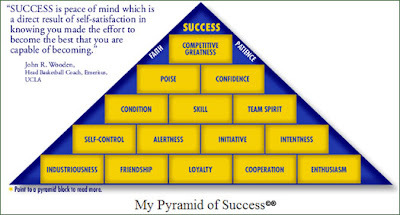 The insight on the Pyramid of Success alone is worth the trip. After spending over three decades in self-improvement and hearing the stories of hundreds of people who are still struggling, the number one observation that stands out above all other is that, people fail to achieve success because they cannot get themselves to take action. Knowing what should be done to succeed is the easy part. It can be found and learned in any of thousands of books, CDs, tapes and videos on the subject. But knowing how to succeed is just the first and easiest part. Taking action and putting into motion what has to be done to succeed is, for the overwhelming majority of people, the hardest and most difficult part. It is said that faith without work is dead. The same applies to knowledge. Knowing how to build a house will not build a house and knowing how to succeed will not make anyone a success unless action is taken and what needs to be done is executed. There are many reasons why people procrastinate and fail to take action but the most important and most prevalent is the fear of failure. Failures are frightening. They undermine the self-esteem and they invite ridicule. That may be true but something else should be brought into the equation and that is the fact that not taking action is the worst failure of all. Not even trying is infinitely worse than not succeeding. The question then becomes, "How do we get ourselves to take action?" For anyone serious about succeeding there are three very specific steps that must be taken. 1. The first of these steps would be a small but extremely important change in vocabulary. The word "should" has to be replaced by the word "must." It is a small distinction but one that has a profound impact. The word "should" does not imply a commitment. It gives the impression that what "should" be done is somehow optional. On the other hand, there is no ambiguity about the word "must." What "must" be done has to be done and no excuse is acceptable. If I "must" do it, chances are that I will. 2. Number two implies specificity. A very specific plan has to be established along with a schedule with date lines. Execution without a schedule and a plan is destined to fail. No one would start off on a trip without knowing what the route, the destination and the itinerary is. Same thing with a life or career project. If we don't know where we're going and how we're going to get there, chances are very high the adventure will end in failure. 3. The last, and most important step is, accountability. Something or someone has to see to it that the plan and the execution goes on according to the schedule. Trusting ourselves as overseer is usually a mistake. It is too easy to find excuses and pretexts to get us off the hook and allow for complacency. We need a coach, preferably a drill sergeant who will be hard as a nail and will not tolerate any weakness or lack of effort. That person can be a professional coach and it would be a wise investment. Or it can be a friend or relative who has shown leadership capacities. That person will be the cornerstone upon which the whole edifice will be built. Having such a person in our corner is a strategy that is used by every mover and shaker that have ever made history. It's a must. Success is a science and not a fluke. To succeed, steps must me taken and procedures have to be followed. The three steps described here constitute the starting point. If you are serious about succeeding, this is where you start. 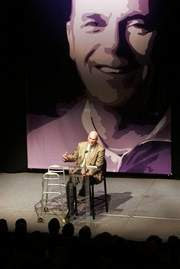 Thanks to Eric Musselman for finding this article on Don Meyer and his return for a day to Lipscomb University. It was coaching, he said, that helped him battle back. "Having something to think about besides your injury is a good thing," Meyer said. "The more you think about your problems, the more you compound them." A few thoughts on the responsibility of a coach from Bear Bryant. "If we have an intercepted pass, I threw it. I'm the head coach. If we get a punt blocked, I caused it. A bad practice, a bad game, it's up to the head coach to assume his responsibility. … If anything goes bad, I did it. If anything goes semi-good, we did it. If anything goes really good, then you did it." BIG SYL = BIG SUMMER!!! As a coach, you wish well of all your players. But there are always some that work so extremely hard to make themselves better that you gain a special feeling of satisfaction as they achieve great things. One such player for me is Sylvia Fowles. Growing up in the rough part of Miami Sylvia leaned on a strong mother and made herself into a good basketball player. At LSU she worked extremely hard to become a special player. She was the first to the gym and the last one to leave. She was the hardest worker in the weight room. This past summer she was the one of the leading scorers and rebounders for Team USA as they captured the Gold Medal. In two weeks, on May 15, she will walk across the stage and receive her degree. Below is a link of the great summer she had playing in the extremely competitive Euroleague. Excuse a proud coach for bragging. Offensive basketball has evolved greatly from the game's infant days in the 40's and 50's. Creating an offense takes time and creativity. It also must include provisions for the kind of players on your team and their talents. A good coach puts each player in positions on the floor where they can be successful. Many times being successful does not mean scoring points. Each player has a unique set of skills. If these skills are maximized, the end result will be a well-oiled offensive machine. Choosing which kind of offense is right for you as a coach deserves your full attention. The offense you rely on will partially determine the success of your team. Motion offense allows for great flexibility while putting great pressure on the defense. My coaching experiences with motion offense has grown from time spent with great coaches. Lute Olson, Gary Garner, Rich Glas, Kevin O'Neill, Dan Hipsher, Tim Floyd, and Larry Eustachy. Each introduced new and productive ideas to motion offense. Joby Wright, a former player and assistant coach for Indiana's Bob Knight, taught me more about "true" five-man motion than anyone. My experiences with these coaches has been priceless, and has allowed me to introduce these 15 advantages of motion offense. 1. Motion allows for creativity and imagination. Keeps offense from being stagnant and boring. 2. Motion allows intelligence to be an asset. Players with high basketball IQ excel in motion. 3. Motion incorporates and emphasizes solid fundamentals. Triple threat skills are key. 4. Motion allows you to persevere over the opponent with patience. Defenses break down quickly, especially in high school with no shot clock. 5. Motion provides for excellent shot selection and increased FG %. 6. Motion is totally unpredictable and each possession is unique. The "Snowflake theory" states that no two possessions are ever alike. 7. Motion is impossible to scout because each possession is different. 8. Motion wears opponents down defensively, leading to unproductive offense. By making your opponent guard motion, they are less able to score on the other end. 9. Motion asks, "Who wants to guard motion for 20-35 seconds a possession?" The answer is everyone you play! 10. Motion allows you to win the mental war on the floor. Winning the mental game is a characteristic of good team in all sports, at any level. 11. Motion is unique and challenging to teach, and will keep the coach sharp. Coaches must continue to stretch themselves by learning new concepts and ways to play. 12. Motion makes you defense better everyday. Since motion is the most difficult offense to defend, your team improves defensively each night out. 13. Motion creates increased free throw attempts. Motion teams win from the line consistently. 14. Motion is like a lump of clay, you can mold it to fit your personality. Flexibility to change as day to day situations occur with your team. 15. Motion can be run effectively against zones. Team one offense instead of 5 or 6. Randy Brown has passion for the game of basketball. 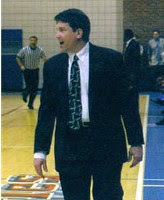 He works as a basketball consultant and mentor for coaches. Visit him at http://www.coachrb.com for free resources, Q & A, newsletter, and coaching programs. A speaker and writer, he has authored 75 articles on coaching and is nationally published. His 18 years in college basketball highlights a successful 23-year career. Mentored by Basketball Hall of Fame coach Lute Olson at Arizona. Resume includes positions at Arizona, Iowa State, Marquette, Drake, and Miami of Ohio, 5 Conference Championships and 5 NCAA appearances. His efforts have helped develop 12 NBA players including Steve Kerr, Sean Elliott, and Jaamal Tinsley. To contact Randy, email him at rb@coachrb.com. Two of my heroes in the coaching profession are Holly Warlick, the Associate Head Coach at the University of Tennessee and Nikki Caldwell, the UCLA Head Coach. A few years ago they came up a way to create awareness for breast cancer while raising funds to help find a cure. They jumped on the motorcycles and started driving around the country find corporate sponsors and individual donors (including me). This year I'm excited because the tour roles through Louisiana. Here is a little about their organization from their website along with a link if you'd like to learn more. Cruisin’ for a Cause is a long-haul motorcycle adventure to raise dollars and awareness for a cure for breast cancer. Led by Tennessee Lady Vol Associate Head Coach Holly Warlick and UCLA Head Coach Nikki Caldwell, we have raised nearly $100,000 and traveled over 6,000 miles to support the fight against breast cancer as a life threatening disease. We are currently planning for the third annual event – a road trip down the Natchez Trace to New Orleans and back. Click here to see the 2009 map and schedule of events. Raise thousands of dollars to support our grantees. Recruit tens of thousands of people in person and through the media to join in the fight against breast cancer. 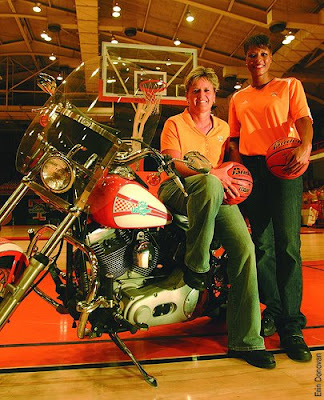 By helping to support efforts such as the University of Tennessee Breast Health Outreach Program, Kay Yow/WBCA Cancer Fund, and The Wellness Community of East Tennessee, Cruisin’ for a Cause is making a difference. Cruisin’ for a Cause is part of the 501(c)-3 Champions for a Cause. Got a bike of your own and want to ride with the coaches? Join us for the TaTa Tour, the local kick-off event for Cruisin’ For A Cause. This is a short day ride followed by a great after party where you can meet and hang out with Holly and Nikki and the rest of the Cruisin’ Crew. Click here to see a map. Number of participants is limited so register today! -We have what it takes to win. - This is the key to winning the gold. - We do the dirty work. - We look each other in the eye. - We tell each other the truth. - We are committed to each other. - We have each other’s back. - We give aid to a teammate. - We respect each other and our opponents. - We’re always on time. - We take good shots. - We’re aware of team fouls. - We know the scouting report. - We show no weaknesses. - We can handle any situation. - We make the extra pass. - Our value is not measured by playing time. - We play hard every possession. - We have no bad practices. - We are the best team in the world and we represent the best country. - We believe in our own abilities. - We believe in each other. - We let nothing linger. - We tell the truth immediately. - We have each others back. - We have what we need to win. - We have winning faces. - We show no weakness. - We can be counted on. - We win and lose together. - We bring energy everyday. - We are always on time. - We prepare for every opponent. - We are aware of team fouls. - We give aid to a teammate immediately, on and off the court. - We play hard everyday. - Our value is not measured in playing time. - The time is now-not the past. - No one is closer. - We represent the best program and the best school in the country. I have asked people for years to describe the characteristics of their most successful and rewarding team experiences. At the top of almost everyone’s list is a clear purpose, focus, or mission. But further, for long-term motivation, it must be a purpose or mission that they find aligns with their personal wants and needs. One can be asked to participate on a temporary task force. If the mission is clear, he might be able to sustain motivation for the duration if he feels it is important. However, if it is a topic that is not in line with his wants and needs, his motivation to continue may diminish. Many years ago on a construction project, I had assembled a group of electricians to streamline the process of making cable terminations. Since they were all electricians, I thought there would be great interest in working on a process that was frustrating people the way it was designed. About a month into the group’s work, they were having great difficulty maintaining momentum and focus. When I asked them why, they said that some of the electricians were conduit specialists and some were cable tray specialists, and that those not working directly with the cable terminations simply couldn’t get interested in the subject. What a lesson for me! Motivation in this case was lacking because the team’s purpose was not in line with some of the members’ wants and needs. So one strategy with a lethargic team might be to stop the process, re-visit the team’s purpose or mission, and see if there’s alignment on it. Even with a team that seems well-motivated, it still is a good strategy to recheck once in a while. Another term that I hear frequently when I ask about team motivation is challenge. The human species, as with most animals, has been given a survival mechanism called fight or flight syndrome. When presented with a challenge, our defenses are alerted to move us to action....to run away from danger or address it directly. Many people will say that their most rewarding team experiences resulted from some sort of challenge. I’ve heard the stories often of mediocre groups that responded to a challenge with heroic success. The challenge itself was the motivator. In the workplace, these challenges occur infrequently. Teams are not presented with stimulating challenges every day. So the question becomes how to provide challenges to the team at more frequent intervals. An additional criteria for a challenge is the level of difficulty. If a challenge is too difficult, perhaps perceived as impossible, then team members may give up before they start. However, the same result may occur if the members perceive the challenge as too easy. Little energy is required to accomplish something so easily obtained. So for ongoing teams, periodic stimulation in the form of a worthy challenge is another method of maintaining motivation. In 1983, I was managing a work group for a large construction organization. It was a long-term project (10 years), and senior management had discussed conducting an open house for the workforce. Management, however, had always nixed the idea--fearing the difficulty of coordinating an event that would encompass seven thousand workers and their families. My work group heard about the idea, however, and asked to take on this assignment. There was enormous interest in conducting this event within the workforce, so with much support, my group planned and successfully coordinated an open house that ultimately attracted over 10,000 people. The challenge for my group was enormous....but achievable. The challenge created high levels of motivation while planning the event; and the sense of accomplishment after the event sustained motivation even longer. I don’t suggest by this example, that every work group take on such a formidable task, but simply think about the implications of taking on a new challenge periodically. Seldom, if ever, in our MBA programs (which purport to be leadership development programs) have we seen courses of study in team development and motivation. That is changing now and will continue to change in the future. If one studies highly effective groups, one finds that the most successful groups over the long haul tend to address both the technical needs and human needs. These groups are at the same time competent in the work they perform and highly functional in their interpersonal relationships. The group is well balanced in both technical and human skills. Another factor that emerges from my queries about successful teams is camaraderie, meaning comradeship, fellowship, and loyalty. The people on these teams genuinely like each other and work hard to develop and maintain their relationships. Although they are probably not aware that research supports this behavior, they just seem to understand that it’s a lot easier to support your team member when you have a good relationship. The fallout from this kind of relationship building is open and direct communication, frequent praising of each others’ contributions, and mutual support. So, you will say, that is all well and good for teams whose members like each other, but what if they don’t like each other? Much of the time we like or dislike someone, it relates more to how well we understand them. And since our formal training has not addressed this, most of us enter adulthood ill-equipped to deal with the myriad of personalities, temperaments, cultures, values, beliefs, ideologies, religions, and idiosyncratic behaviors of those we meet. One way to break down these barriers is to expand one’s understanding of his own species. Training is available to address most of the topics above, and exercises can be beneficial if they move us to another level of understanding. But don’t overlook the simple solutions. Designing an off-site activity for the team, sometimes just to play together, is a powerful way of building camaraderie. For more thoughts on this, see our article "Celebrations and Events to Build the Team." In general, people and teams are stimulated by being given responsibility. Having ownership of an identifiable block of work is a long-held tenet of motivation in groups. Responsibility can be tricky, however. Implied in this concept is the understanding that the responsibility comes along with authority to make the necessary changes. Teams that have both the responsibility and authority tend to maintain motivation over longer periods of time. Responsibility can be demotivating if the consequences of error or failure are too great. If the organization, for example, has a history of punishing mistakes, then the giving of responsibility is viewed more as a negative. The short-term performance may be good (remember fear is a motivator), but long-term motivation will suffer. It is difficult to sustain high performance when energy is being sapped by fear. Finally, personal and team growth can provide another basis for sustained motivation. When people feel they are moving forward, learning new concepts, adding to their skill base, and stretching their minds, motivation tends to remain high. Personal growth adds value to the individual, enhancing self-esteem and self-worth. Accordingly, team members and team leaders should look for opportunities that help add knowledge and skills. A good technique is to simply ask members what they would like to get from their association with the team, then listen for areas of possible growth. A good leader can be a catalyst for motivation in the short term, but the best leaders create the conditions for the team to motivate itself. We have all seen examples of how leaders inspired teams to accomplish some phenomenal task. History books and Hollywood are full of these stories, and we come to honor these leaders. But the charismatic leader that can be so effective in the short term, cannot necessarily sustain motivation indefinitely. Motivation is inherently intrinsic, residing within oneself. Therefore, if one depends continually on another for their source of motivation, eventually it ends. Great leaders have a knack for helping others see the best in themselves, providing the stimulus for self-actualizing behaviors. But great leaders also understand the importance of team purpose, challenge, camaraderie, responsibility, and growth, and focus much of their time on creating the conditions for these to exist. Great leaders understand that their team members have needs, and that for motivation to grow and continue, the activities of the team must help in some way to meet these needs. A neat little article I found on ehow.com. Step 1: Know what you can and cannot do. Too many players try to make plays that are beyond their ability. John Stockton always knew what he could and could not do. He made the safe passes. He threw crisp chest passes, bounce passes and wrap around passes. He was not concerned about making high light reels; all he wanted to do was get his teammates in position to make an easy open shot. If you want to play like John Stockton, be unselfish and make safe passes. Step2: Play for your teammates. John Stockton could have averaged well over twenty points a game whenever he wanted. He was one of only a handful of point guards who consistently shot over fifty percent from the floor. However, he never averaged more than 17.2 points per game. He was dedicated to getting his teammates good shots. Everyone wanted to play with him as their point guard and if you can play like John Stockton, everyone will want to play with you. One of the toughest players to get around when he set a pick was John Stockton. He was always setting screens on bigger players and drawing fouls because they would become agitated and finally just push him down. He was also tenacious on defense and worked very hard to get the ball back. Step4: Master the pick and roll. 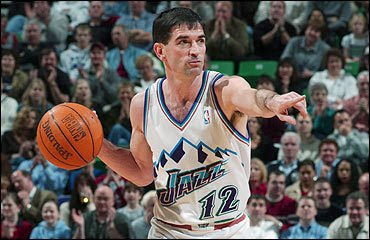 The play that John Stockton was known for was running the pick and roll with Karl Malone. Every pick and roll that is run correctly puts the defense at a disadvantage. Once you know how to capitalize on that disadvantage you can play like John Stockton. You can dominate a defense and get your teammates easy shots. Stockton was a tremendous shooter. It was a great weapon that prevented defenses from sagging off of him. If you gave him even a little room, he could hit any shot from the three point line and in. In order to play like Stockton you need to have a better than average jump shot. "You spend a good deal of your life gripping a baseball, and it turns out it was the other way around." "Play like you're in first, but train like you're in second." "Hard work and togetherness. They go hand in hand. You need hard work because it's such a tough atmosphere. You need togetherness because you don't always win and you gotta hang tough together." "Be and look prepared. Be a man on integrity. Never break your word. Don't have two sets of standards. Stand up for your players. Show them you care on and off the court." "The fans can only make you famous. A contract can make you rich. The press can make you a superstar. But only the love of the game can make you a player." "Almost all of our limitations are self-imposed. Those that are not can be overcome by cooperation with others whose strengths compliment our weakness." "Champions separate the important from the unimportant. They know that good press, playing time, or individual honors aren't as important as knowing you and your teammates have responded to the challenge together." "Even when you've played the game of your life, it's the feeling of teamwork that you'll remember. You'll forget the plays, the shots, and the scored, but you'll never forget your teammates." "Individual commitment to a group effort -- that is what makes a team work." "The glory of sport comes from dedication, determination, and desire. Achieving success and personal glory has less to do with wins and losses than it does with learning how to prepare yourself so that at the end of the day you know there was nothing more you could have done to reach your ultimate goal." "The difference is almost all mental. The top players just hate to lose. A champion hates to lose even more than she loves to win." "Win or lose you will never regret working hard, making sacrifices, being disciplined, or focusing too much. Success is measured by what we have done to prepare for competition." 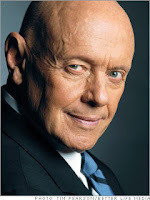 A few words of wisdom from Stephen Covey from his amazing book that he wrote with Roger and Rebecca Merrill, "First Things First." This is a book that should be read by all people regardless of profession. It is a wonderful look at the way we live our lives and how to get our lives in order by priorities and organization. For most of us, the issue is not between the "good" and the"bad," but between the "good" and the"best." So often, the enemy of the best is good. Our struggle to put first things first can be characterized by the contrast between two powerful tools that direct us: the clock and the compass. The clock represents our commitments, appointments, schedules, goals, activities -- what we do with, and how we manage our time. The compass represents our vision, values, principles, mission, conscience, direction -- what we feel is important and how we lead our lives. There's a vial difference between efficiency and effectiveness. One things for sure: if we keep doing what we're doing, we're going to keep getting what we're getting. Anything less than a conscious commitment to the importance is an unconscious commitment to the unimportant. 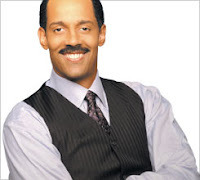 The following comes from Success Magazine in an article by author and motivator Keith Harrell. "One of the most important steps you can take toward achieving your greatest potential in life is to learn to monitor your attitude and its impact on your work performance, relationships and everyone around you." Humor is a powerful motivator. The more humor and laughter in your life, the less stress you’ll have, which means more positive energy to help you put your attitude into action. There are also health benefi ts to lightening up. "I never met any athlete who worked as hard on his game as Tiger." 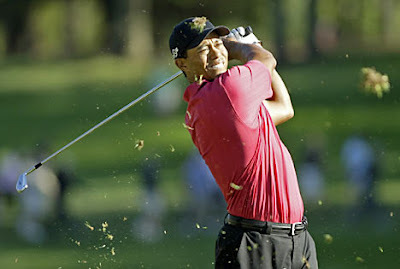 Tiger knew the secret to mastery when he was only six years old. Tiger already had made two holes-in-one. People would ask him, "How did you get so good, Tiger?" And he would answer, "Practice, practice, practice." When you're unconsciously incompetent, you don't know that you don't know. There was a time early in his life when Tiger didn't know that he didn't know about golf. There's nothing wrong with that. Ignorance is the first stage of mastery. When you're consciously incompetent, you know that you don't know. Knowledge moves you from state one to state two. In stage two, you're motivated to take action. At this state, you know that to do and you can perform the activity, but you have to put all your focus on doing it. When you're unconsciously competent, you can do the activity without thinking about. It seems natural to you. "My body does the work, and I just sit back and let it happen." A mastermind alliance is built of two or more minds working actively together in perfect harmony toward a common definite object. Choosing the people who will help you attain your goal must be done carefully. The first quality is ability to do the job. The other quality is the ability to work in a spirit of harmony. There are four areas of focus for maintaining your alliance: confidence, understanding, fairness and courage. No one's education is every complete. When we mention 5/5 whole method you are probably thinking of scrimmage situations and generally that is true. We do however utilize a 5/5 Motion Game that has become the most competitive part of practice. This is a game between our team, typically broken into even squads. We play the game in five minutes on a running clock and utilize the shot clock. We can start each possession from the side or at the circle at half court. If your team scores, you keep the ball. We keep score and the losers run. The key is how you keep score! We want to emphasize getting the ball inside, so all baskets are worth one point unless they are scored in the paint in which they are worth three points. Maybe we didn’t screen well yesterday so today we tell them no points for scoring baskets. But you get one point for each screen. Of course the screen must first be called out verbally, then set at the proper angle. Should you want to place a premium on low post play you can award a point for each low post touch. Not getting any ball reversals in your offense? Today we will give you two points for each ball reversal. This is also yet another area that can be defensive oriented. Because your team is playing against each other, that point system can emphasis defensive play as well. Perhaps your low post defense is struggling. The two points for a low post touch puts pressure on your defense to deny that pass if they want to win. Losers usually run a 30 second suicide. It is a very competitive game and one that has helped us get better offensively, defensively and made us a little tougher at the same time. Restrictions are a great way to daily mold your motion offense. We don’t like our help to hide. In other words, we want our help to be active and vocal. We want the offense to know that there is help in the paint. We want to discourage drives and lobs into the post. We want to convey a look of a crowded lane area. The goal is to be in good enough position that the offense doesn’t test the help. Good defense has help if needed but a great defense defends in such a way that the help is rarely tested because they defend the ball properly and the offense sees the helpside already in position. We will occasionally trap out of our help. One such situation is when we get beat on the side and the ball is driven baseline to the block. We want to escape the paint to help and this is an automatic trap situation. The helper will come out and stop the ball while the defender on the ball will recover and form the trap. We believe this is a great technique that if properly formed, will discourage teams from driving baseline even if they do have a driving lane available. 1. Get up every day knowing nothing. Be like a sponge and learn each day. You never know it all. Be a good listener and ask questions. 2. Everyone you deal with in the organization is important. 3. Be serious about your job, but have fun doing it. 4. You are being watched as a coach. You have to live it and not just say it. 6. Work with a purpose and know how what you are doing fits into the big picture. 7. When you ask players to do something, they must be able to respond. 8. Never get away from teaching the fundamentals. They never go out of style. 9. Always find ways to learn what makes people tick. 10. Understand learning disabilities and how they affect your players. Not everyone learns the same way and as the same pace. You can't treat them all the same. Researcher Damian Rotter found that 78 percent of the population is driven by something outside of them, clutter; in other words, only 22 percent is not driven by clutter! To become the 22 percent, you need only not to plant thoughts that have the purpose of sinking your vision deeper. But there is more. The closer to pure your thoughts of your vision are, the greater the likelihood of their manifesting themselves. The challenge is that all day long you and I often have thoughts counter to the vision popping in our heads, and when we let these thoughts sit there, it is like planting a desired plant to germinate, but then letting all those undesired weeds grow beside our vision, squeezing the nutrients from the soil and eventually choking what we desired to death. You must constantly remove the mental clutter like daily pulling undesired weeds. And as this research suggests, the thoughts are constantly coming in from the outside, and then these outside thoughts are taking over like a bunch of bad weeds overpowering a beautiful rose garden. A.J. Muste stood outside the White House lawn during the entire Vietnam War, holding a candle. Once a reporter came to him and said, "You will not change the world by doing this." He said, "I am not trying to change the world. I am doing this so the world does not change me." It's official -- I've entered the Twitter world! If you are hooked up to Twitter hit me at www.Twitter.com/LSUCoachStarkey. 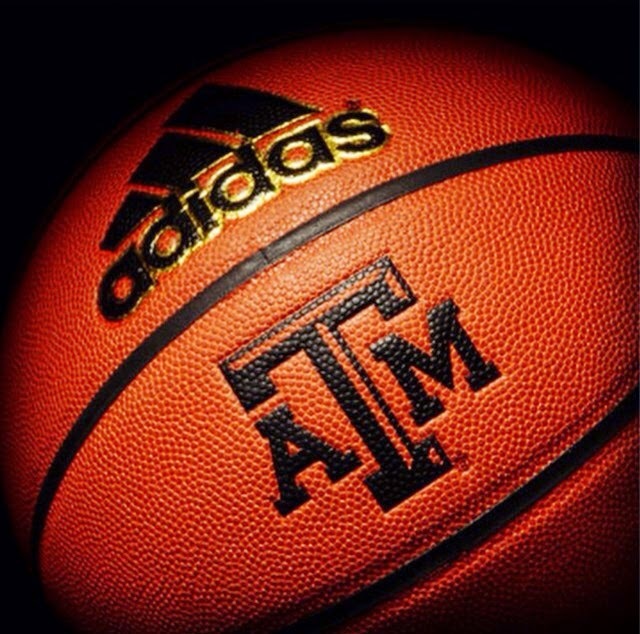 Besides twittering on the goings on of Lady Tiger Basketball I will also send out a Tweet each time I update my blog. By the way, I'm not the only one twittering. There are a lot of coaches out there putting some good stuff up. My favorite? Eric Musselman at http://twitter.com/ericmusselman. If you have missed the articles that Coach Musselman posted on his blog, he is now doing it via twitter. Want more information on Twitter or to sign up? Simply go to www.twitter.com. Coach Tom Crean has three things he expects each day in practice. #1 COME IN MENTALLY PREPARED -- come in absolutely ready to practice, lift weights, etc. No cell phone, not finishing meals, or any other last minute stuff. #2 COME IN WITH ENERGY -- you either take or give energy...the only person who is allowed to bring negative energy is the coach. Your responsibility as players and coaches is to make the head coach better everyday. Assistants coaches should also be worried about what the coaches and players need for games, practice, etc. #3 COME IN READY TO COMPETE -- It is not enough for your team to "think" they are competing and playing hard, you must actually make sure that they are. Playing hard is not enough -- you must compete. I would imagine that everyone that follows my blog is fully aware of Brad Winters and his wonderful website Coach Like A Pro. If you haven't visited it the link is below and believe me, it's a website you want to visit. I first met Coach Winters while on Dale Brown's staff. 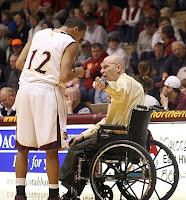 Talk about a guy that is passionate about teaching the game of basketball! From the standpoint of range, his website is hard to beat. It covers every area of coaching and teaching, as well as all phases for all levels. And why not? Coach Winters has coached on all levels all over the world and he is kind enough to share his experience with us. “The greatest blessing of our democracy is freedom. whatever the field, I would pick the trait of persistence. The main reason for early offense, accompanied by flow action, is to force the defense to react rather than act! This simply put is to advance the ball quickly into the front court areas and attack before the defense is able to become organized into a disruptive force. As a defensive specialists over the many years of coaching, we have found that the most difficult teams to defend were the ones with offenses that pushed the ball into the front court, hash mark areas in the time span of 2 to 3 seconds. 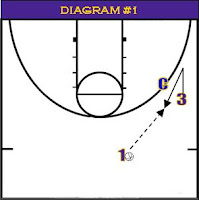 This early offense push creates quick medium jump shots, or penetration lay-ups, or kick out passes for scores to occur before the defense had a chance to set up and disrupt any organized set play. We have also found that when teams walked the ball up the court, they were much easier to defend because the defense was able to get its players back into positions near the basket were they could execute pressure denials, traps to disrupt the offensive flow and to force rushed shots as time on the clock became a factor. Holding a grudge is easy. Telling a secret is easy. Going to the glass is easy. Holding the seal is hard. Cutting off a screen is easy. Shoulder to shoulder is hard. Defending the ball is easy. Getting a hand up on the shot is hard. Being a friend is hard.